Could a clever hack turn an environmental disaster into a new fuel source? Waste plastic is choking the Earth’s oceans and poisoning its wildlife. 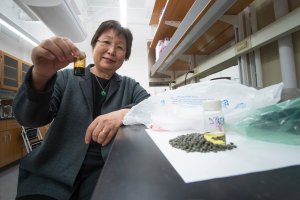 That’s why researchers at Purdue University are excited about a new chemical technique technique that turns waste plastic back into useful polymers — or even clean fuel. The new technique works on polypropelene, according to a new paper published in the journal Sustainable Chemistry and Engineering, which is used to make everything from toys to snack food bags. The technique users super-heated water to convert the plastic into a gasoline-like fuel that could be used to fuel conventional vehicles. Polypropelene accounts for about 23 percent of the five billions of tons of plastic waste that’s been cast into landfills and the environment, according to the new research — meaning that if it could be turned into a valuable commodity, it’d create a huge incentive to recover and re-purpose it.